If we’re going to meet the food needs of a growing world population while sustaining the natural resources on which we all depend, we’re going to need the help of American farmers. From organic to conventional, local to global, small to very large, everyone will need to do their part — including companies working in the agriculture supply chain that brings food to our tables. That’s why I was so excited to attend the Walmart Sustainability Expo in Bentonville, Arkansas, this week with a farmer who has a deep commitment to economic and environmental sustainability on his operation. 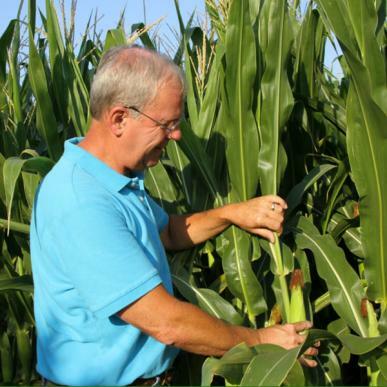 Len Corzine grows corn and soybeans around Assumption, Illinois, and has been a leader in the agricultural community for a long time. He is now contributing his insights and experiences as a farmer to help major food companies meet Walmart’s preference for nitrogen-efficient products. Len was invited to Walmart’s Sustainability Expo to spread the gospel of sustainable agriculture. He employs several conservation strategies. Instead of scrapping field waste away before planting, Len uses conservation tillage to leave crop residue behind so his soil is healthier and his fields more resilient to volatile weather. And healthy soil translates into bigger crop yields. Modern technology also enables Len to apply just the right amount of nitrogen fertilizer at the right time to sustain high yields while ensuring that as little as possible escapes into the water and air. Nitrogen fertilizer can be a significant contributor to water pollution and emits a potent greenhouse gas called nitrous oxide. By improving the efficiency of his fertilizer use, Len is not only helping the environment, he’s improving his bottom line too. In 2010 Walmart committed to eliminating 20 million metric tons of GHG emissions from its global supply chain by the end of 2015. Since the emissions from fertilizer use are the number one “hot spot” for nearly half of Walmart’s top 100 products, including farmers like Len in the company’s supply chain, conversation about sustainability is key to a successful campaign to address climate change. “It is encouraging to have direct lines of communication and real commitments from companies like Walmart. It’s that kind of dedication that creates real opportunity at the farm level for farmers to link with their customers. Collectively we can engage in practices that conserve and enhance natural resources while increasing production,” Len told me. “My goal is to leave my farm and my land better off for future generations, and Walmart is creating more of a market demand for me to do that,” Len added. Farmers like Len aren’t the only ones who will help Walmart meet its GHG reduction goals. All the companies involved in the supply chain — agribusinesses, food companies, major retailers — will have to do their part to achieve the levels of sustainability needed to both feed a growing population and improve our environment. We’ve come a long way, and we have a ways to go to, but today in Bentonville we can celebrate the hard work by U.S. farmers like Len Corzine for doing it right. This entry was posted in Climate Resilience, ecosystems, fertilizer, Partnerships, Sustainable Agriculture and tagged nitrogen, Walmart. Bookmark the permalink. Both comments and trackbacks are currently closed.